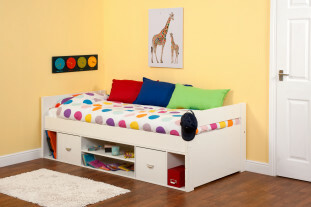 This fantastic Mid sleeper combination has everything you need for sleep, storage and study. With it’s gorgeous slatted end panel detailing, pearly white finish and classic Scandi design this bed is timeless and will last throughout the years to come. Made from a solid pine this bed is very sturdy and robust. Like all Nordic beds this mid sleeper is part of the building system so in the future you can convert this bed into a high sleeper, bunk bed or back down to a single bed.